July 24, 2007 — Ancient Japanese people believed that gods lived in all things, whether animate or inanimate. Talking to a wall was not an idle act, but actually a kind of soul-searching. And usually, the wall talked back. Now a table and a set of chairs embodies that philosophy. 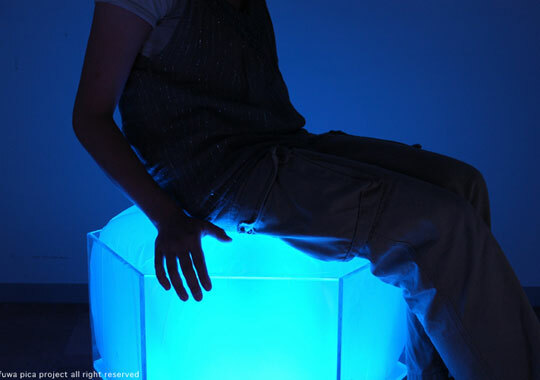 Called Fuwapica, which loosely translated means "soft and flashy," the furniture senses people's presence and gradually changes colors accordingly. The interactive set, which could be in shops, airports, museums, or bars within a year or two, uses technology to extend people's emotional state into a room that may be devoid of ancient ideas. "We want modern people like us to remember that there was an interaction between people and furniture," said Ichi Kanaya, assistant professor at Osaka University.